My fellow Duck fans, today Oregon begins spring practice and the 2015 season officially upon us. The Ducks will be chasing a national title once again, but the first step to another national title game appearance starts today. As spring football kicks off, there have been some minor changes to the team. First, freshman quarterback and early enrollee Travis Jonsen (formerly Travis Waller) will be using his mother’s maiden name as he begins his college career. Jonsen, who will be in the mix for spring reps with Jeff Lockie, Morgan Mahalak, Ty Griffin, and Taylor Alie, is one of five freshmen that are on campus and will participate in spring practice. Five-star defensive lineman, Canton Kaumatule, headlines the class of freshman to arrive in Eugene early. Kaumatule is joined by Jonsen, defensive back Ugo Amadi, wide receiver Alex Ofodile, running back Taj Griffin, and offensive lineman Zach Okun as the five prepare for their first practices as Ducks. And with those freshmen on campus, Duck fans will get their first look at what number each freshman will be wearing. According to Rob Mosley, Jonsen will wear No. 11, Kaumatule No. 99, Ofodile No. 4, Griffin No. 5, Amadi No. 14, and Okun No. 75. 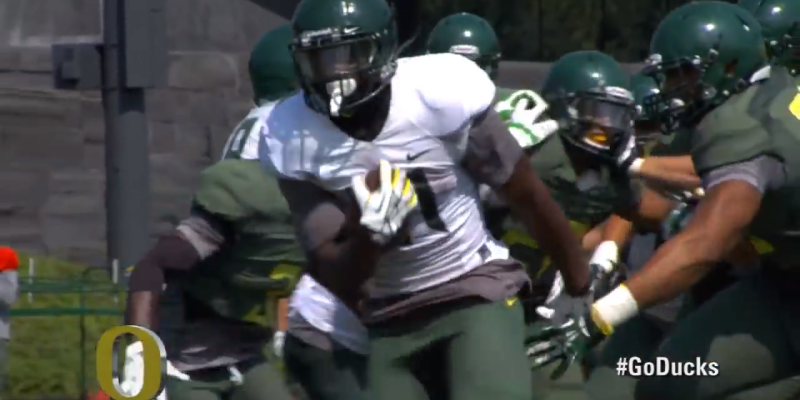 Addison is ready to bounce back from injury and lead the talented group of Duck receivers in 2015. Also, as freshmen get new numbers, some veterans have decided to change their number as well. 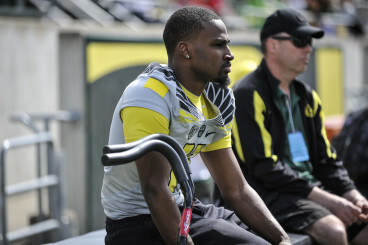 The most notable change will be Bralon Addison, who will change from No. 11 to No. 2 as he begins his junior season after missing all of last season with a knee injury. Other wide receivers have decided to change their numbers also; Darren Carrington will be in No. 7 this year and Devon Allen, who switched from No. 13 to No. 5 last season, is back to No. 13 for 2015. As for the defense, there will be a few minor changes on that side of the ball, as well. Sophmore strong safety Tyree Robinson will wear No. 3 this year as he attempts to earn a starting spot in a secondary that needs depth. In fact, adding to that depth is another change – Charles Nelson, who played wide receiver and returned kicks last season, will try to help out a depleted secondary. Nelson isn’t new to playing defense, though, as his versatility allowed him to take practice reps on defense over the course of last season. Today is only the first of 15 practices from now until May 2, when the Ducks will host the spring game in Autzen Stadium at 11 a.m. Players will step up and impress coaches to earn playing time, depth charts will be shuffled time and time again, and hopefully the injuries remain at a minimum when it’s all over with. Spring practice means football is officially back in Eugene, so remember to stay tuned to FishDuck.com for complete coverage of your beloved Ducks.